On a production box, the backup jobs have been failing with an interesting and perplexing error. Its says “Not enough disk space“; As you can guess, this is one of those confusing or misleading error messages that’s not what it seems on the surface — Making it worthwhile for a post of its own. This error occurs in both backups with & without compression; And in FULL & Differential backups. This is a fairly large database, ranging up to 18 TB. So, backups are an ordeal to perform. So, when DIFF backups started failing, it was a bit concerning too. After attempting several backups on local & remote storage with plenty of space, a pattern still did not emerge. The only constant is that it fails around 70% completion progress. At that point, one of my colleagues (Thanks Michael) pointed out that, as part of backup operation, Sql Server will first run some algorithm that calculates the amount of space needed for the backup file. If the backup drive has enough free space well and good, if not, it throws this error. But, as you can guess, we had plenty of free space i.e. peta bytes of free space. At different points, Sql Server runs the algorithm (“pre-allocation algorithm”) to determine if there is enough space. Initially it comes back saying “yes” — and the backup proceeds with writing to the backup file; Again a little later, it checks, and it comes back with “Yes”; But at someone on subsequent checks (in our case between 70% to 72% complete), the algorithm decides there is not enough disk space. So, turns out there is a TRACE FLAG called 3042 that could disable this algorithm from making any assessments — that way backups could progress to completion. Bypasses the default backup compression pre-allocation algorithm to allow the backup file to grow only as needed to reach its final size. This trace flag is useful if you need to save on space by allocating only the actual size required for the compressed backup. Using this trace flag might cause a slight performance penalty (a possible increase in the duration of the backup operation). Using this trace flag might cause a slight performance penalty (a possible increase in the duration of the backup operation). Caution: Manually make sure there is plenty of space for backup to complete — since we are disabling the algorithm. Make sure you test this in a non-production environment, before enabling it in production. A few months ago, we had an issue with a database in our lab environment where the database ended up in SUSPECT mode due to storage issues. Once the storage was fixed, we were able to perform troubleshooting steps on the database. Of those, today we’ll only cover the step that was used to rebuild the transactional log file (rest of the steps will be covered in a future post). An error occurred while processing the log for database 'SampleDB'. If possible, restore from backup. If a backup is not available, it might be necessary to rebuild the log. NOTE: Rebuilding transactional log file will break the restore chain; So any previous transactional log files could not be applied with the backups going forward. Let’s use the name & path in the script below. This is an undocumented & unsupported command, so use caution before you run this in production. Steps like this must be taken only upon guidance from Microsoft CSS. With this script, we could create a new transactional log file. After you runs it, make sure you run CHECKDB & backups. Upon successful log rebuild, lets take a few precautions to make sure everything is till good. While gathering replication backlog details, ran into this interesting error. The goal was to run the sp_replmonitorsubscriptionpendingcmds stored procedure and store the output in a table. As we’ve seen in a recent post, redirecting output of a stored procedure execution into a table is possible; But in this case, it throws an error saying that is not allowed. An INSERT EXEC statement cannot be nested. What is Uniquifier? How does Sql Server distinguish between duplicate entries in an index? For the last few months, on and off, there have been opportunities to run some interesting tests in our lab environment. this resulted in some good posts in the last few weeks. Adding to that tradition is another interesting topic Uniquifier. Imagine a table with multiple records and a Clustered and bunch of NonClustered indexes. In the non-clustered indexes, the b-tree is structured based on the index keys and at the bottom of the tree, the leaf points back to clustered index using Clustering Key. Now imagine the same scenario with a non-unique clustered index, so there could be multiple records with same clustering key values. The dependent, non-clustered indexes now will need a way to uniquely identify between the identical looking entries. Enter Uniquifier column !! An extra 4-byte column called uniquifier is added to all non-clustered indexes to uniquely distinguish between multiple index entries that result in pointing to the same clustering key. We’ll re-use some of the code from previous posts for this. Now, lets look at the contents of the non-clustered index pages. Fr more details on retrieving PageID and query page contents, please refer to the previous posts. As you can see, along with the nCI key column, Name, we also have the clustering key (ID) added to the nCI b-tree structure. Along with that there is a new column called UNIQUIFIER added to the non-clustered index pages. Since we did not add any duplicate values, the UNIQUIFIER column is set to zero. Now, lets add some duplicate entries. As you can see, where there are duplicate entries, the UNIQUIFIER column adds a unique value to distinguish between them. This incremental number is just within the same set of duplicate entries. Two duplicate rows for aa & 1 have the UNIQUIFIER value set to 0 and 1 respectively. For the next set of duplicates the incremental value starts over from 0. So it can accomodate a lot of duplicate entries. So, the uniquifier column helps Sql Server distinguish between two identical entries in the non-clustered index. In Sql Server, as we all know, concurrency is maintained through locks & latches. When a particular row is being retrieved for any activity, a lock is requested on that row a.k.a. Shared lock or Exclusive lock, depending on the nature of the activity performed. Once activity is completed, the lock is released. So, when a large number of records in a table are retrieved, then something interesting happens. 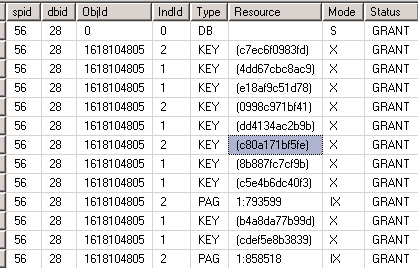 Sql Server, rather than issuing individuals locks on each row, it perform Lock Escalation to lock the entire table. This behavior is helpful in some scenarios and detrimental in others. Each lock takes some resources (memory, etc). So establishing a large number of smaller locks (ROWLOCKs) aggregates to a lot of resources. So, Sql Server escalates the lock to either PAGE level or TABLE level (depending on the scenario). Sometimes this could result in longer waits for the PAGE (or entire table) to be freed from other locks, before this new lock request could be granted. To avoid all of this, sometimes, developers use ROWLOCK to force Sql Server to use ROWLOCK even when performing operations on larger number of records (to avoid waiting for entire PAGE/TABLE to be free from other locks). There are several pros and cons to this approach. As always, the details of the situation guide the best approach in each scenario. One exception to this scenario is, even though we use ROWLOCK, sometimes Sql Server will force lock escalation. Question: At what point does Sql Server, force lock escalation even when ROWLOCK is used? 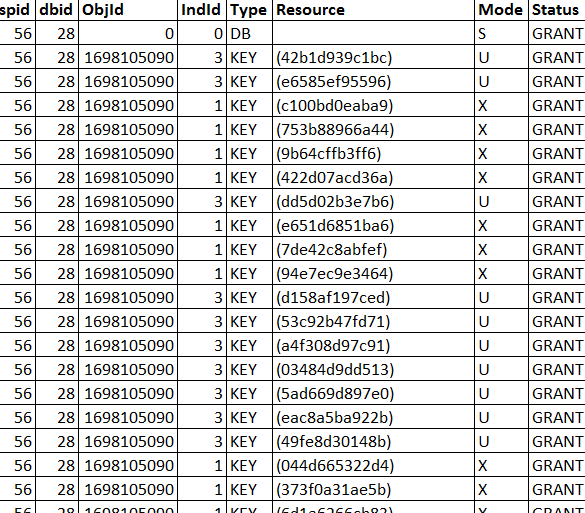 Now, in a different SSMS window, let’s check the number of locks on the table. As you can see ROWLOCKS on keys are GRANTed. Now, lets increase the batch size and see where the force lock escalation happens. BINGO !!! As you can see the lock escalation occurs to TABLOCK level at 6000. Initially, ROWLOCKS are issued; Then just a second later, some locks are escalated to PAGE and subsequently to TABLE level. This is interesting. Question: Does this escalation occur based on a strict number (or range) or is it based on percentage of records being accessed in a table? From the tests, it seems like the LOCK ESCALATION occurs based on the number, and not percentage of records being manipulated. Sql Server makes intelligent estimations on what is better at each level and makes best decisions to escalate locks as needed. Keep the 2000, 4000 & 6000 as general rule in mind and not as a set in stone rule. 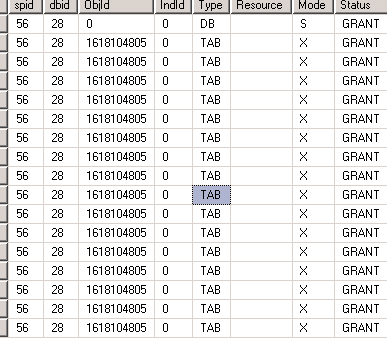 At any given point, Sql Server makes the best judgement call on what is more efficient. Lock Escalation is based on the number of records on which lock is requested and not on the percentage of records relative to the total records in the table. This behavior applies only to Sql Server 2012 as this behavior varies from version to version. In the past, for Sql Server 2008 and before, the number was at 1800 – 2200 before TABLE lock escalation occurs. If this continues, may be for Sql Server 2016, the number would be slightly higher, as Microsoft improves the lock efficiency by reducing the amount f resources required for each lock. This does not mean to go ‘free range’ crazy and use ROWLOCK on every query (obviously) & use 4000 everytime. Keep this information handy in making data retrieval decisions. Each ROWLOCK takes resources (memory & CPU); So we need to use caution and minimize the overhead. This a refined technique to be used in infrequent occassions that seem the most suitable for such techniques. Perfom tests before using in production. Note: Please be advised that such operations are not recommended on a production database. These will result in unpredictable and sometimes reduced performance. Shrinking data or log file does not require single-user mode on the database. Other user activity could be running in parallel without any interference with SHRINK work. SHRINK process could be delayed due to blocking from other user activity, so if possible, perform SHRINK operation when there is lesser traffic. SHRINK operation is a single threaded operation, that methodically works through each data block. So it is time consuming. Before freeing up any space back to Operating sytem, we need to adjust the way space is occupied by all the database pages. Sql Server will reallocate all used pages from the end of the physical file to earlier portions. This allows end of the physical file to be freed up. Once reallocation or adjustment is complete, we could issue TRUNCATEONLY option to free up that space back to Operating System. This is when we see that the physical file reducing in size. In replication, there are several amazing features & configurations to make it robust, dependable & highly performing. These settings need to be correctly leveraged to squeeze out the best performance needed or applicable for each environment. Today, we’ll cover a popular setting called NOT FOR REPLICATION on IDENTITY columns. In short, when NOT FOR REPLICATION is enabled on IDENTITY columns (or other constraints), the IDENTITY value is not incremented when INSERTs occur due to replication traffic. But all other direct application traffic will increment IDENTITY value. Imagine a Sql Server Publisher, let’s say P, that is publishing data to a Sql Server Subscriber, let’s say S. Now, both P & S have table called SampleTable with an IDENTITY column called ID. To make it easy to see the difference, let’s make their IDENTITY definition different at each location (P & S). At Publisher, the IDENTITY value is defined as (1,10). So, its values will be 1, 11, 21, 31, 41, etc. At Subscriber, it is defined as (2, 10). So, its values will be 2, 12, 22, 32, 42, etc. With the above points, let’s create the table and set up replication between P & S. Followins some of the code used to create table at Publisher (P). Similarly, on Subscriber, create a similar table with different IDENTITY definition. So, there is no overlap between IDENTITY values generated at P & S.
Now let’s watch their behavior, as data in INSERTED into both servers. Below is some more code used to check IDENTITY values, Insert new data, etc. in these expirements. With the above set up, lets run through some scenarios and observe Sql Server behavior in each situation. The IDENTITY values increment with each insert as 1, 11, 21, 31, etc. Subsequently, those records are replicated to S, with same IDENTITY values. Since NOT FOR REPLICATION is set on the IDENTITY column on S.
Irrespective of the replication traffic from P, the IDENTITY at S only depends on the records INSERTed directly into S.
Table at S, has records from both P & S.
When manual entry is made at P (using IDENTITY_INSERT) to a new IDENTITY value that does not match with the pattern of IDENTITY definition, subsequent IDENTITY values, at P, are based on the highest entry in the table. It uses the same INCREMENT definition, but it is incremented based on the current highest entry value in the table. Let’s say the SampleTable, at P, has entries like 1, 11, 21, 31 with next IDENTITY value as 41. Now, if a new record is entered manually using IDENTITY_INSERT, with new value as 26. It is successfully INSERTed. Next IDENTITY value still remains at 41. We can keep repeating these steps with different values like 7, 9, 13, 15, 17, 25, 28, 29 (as long as they are below 31). INSERTs will be successful with no impact to next IDENTITY value, which is still at 41. Now, if you perform a regular INSERT, the new record will get IDENTITY value as 41. At S, all new entries, 26, 7, 9, 13, 15, 41, etc, are successfully INSERTed with no impact to IDENTITY definition at S.
Now, lets make a manual entry at P that matches with the next IDENTITY value at S.
At S, the current highest value is 52, with next IDENTITY value as 62. At P, perform a manual INSERT (with IDENTITY_INSERT), with ID value as 62. INSERT is successful at P; And it is replicated to S successfully. At P is set to 72 (62+10). At S, it is still at 62 (even though a new record in INSERTed with 62). Since NOT FOR REPLICATION is set, replication traffic does not influence IDENTITY increments at S.
Now, when a new record is directly INSERTed into S, the next IDENTITY value will be computed as 62, which results in PRIMARY KEY violation. Interestingly, the next IDENTITY value for S, is incremented to 72. In the above test, the next IDENTITY value at P is still at 72. Similarly, the next IDENTITY value at S, is also set to 72. So any new inserts at P, will be replicated to S with 72, 82, 92, etc. If there are any existing records, at S, with same identity values, then replication traffic (from P to S) will fail with primary key violation. Any new traffic, directly at S, will run into PRIMARY KEY violation. So, the summary is, one BAD entry is all it takes to screw up the IDENTITY definition with NOT FOR REPLICATION. When this happens, just RESEED, Identity values at P to a non-overlapping value that is consistent with its expected behavior. Something like 151 or 201. To give it a fresh start with no overlaps with P or S existing records.